Forty-two delighted tenants have moved in to new homes at Thornyflat – completing the development ahead of schedule and on cost and the first built by South Ayrshire Council in a generation. The new £4.5million development, funded by the Council in partnership with the Scottish Government, consists of 42 new homes, a mixture of two, three and four-bedroom properties. After meeting Lynne and others at the Thornyflat development Councillor Nan McFarlane, Portfolio Holder for Social Services said: “This development provides high quality affordable homes for people. 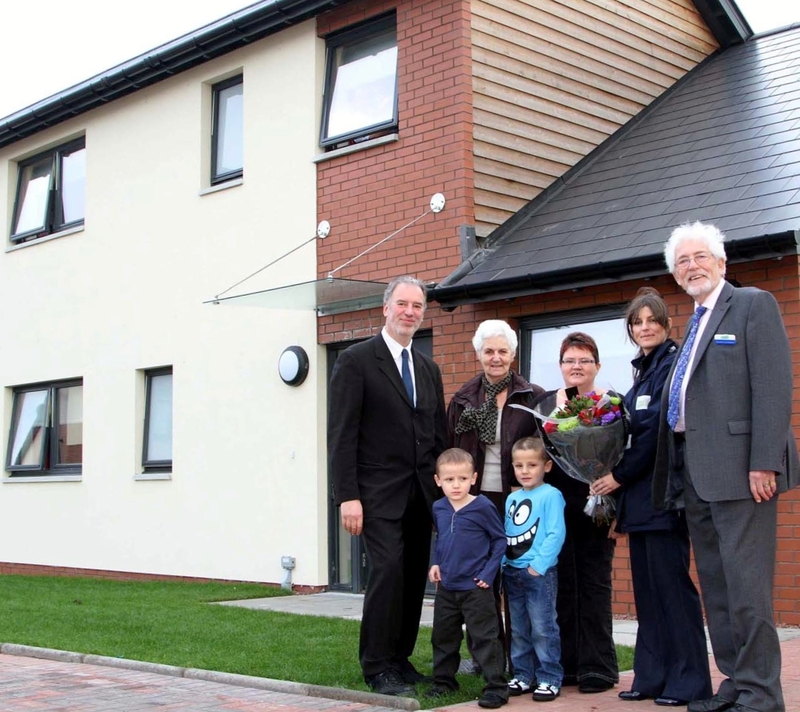 “The homes have been designed to meet the needs of a wide range of people including those who need low level access to enter their home, or wider doors to accommodate a wheelchair or walking frame. 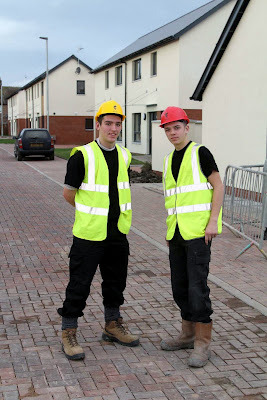 The construction of the new development provided valuable training and employment for Nathan Brown an apprentice bricklayer and Steven McCallum an apprentice joiner. Through Access Construction the apprentices are gaining employment with linked training in the building industry. The programme encourages unemployed people to seek employment with a contractor as an apprentice, trainee labourer or trainee administrator. It targets those who would not otherwise consider applying for a construction job with a training commitment. Originally focused on its own building contracts, Ayrshire Housing has extended the model across Ayrshire through a consortium of four housing associations. The development and day to day management of the project is handled by the Ayr-based Aspire2gether. This independent social enterprise is also a leading provider of housing support and related services across Ayrshire. On completion of the work at Thornyflat both apprentices will move on to other construction contracts with their employer CCG. Access Construction has helped more than 30 individuals to gain employment with linked training in the building industry. An independent evaluation has demonstrated its value both to the individual trainees and to the building contractors themselves. Through the programme, unemployed people are encouraged to seek employment with a contractor as an apprentice, trainee labourer or trainee administrator. Originally focused on its own building contracts, Ayrshire Housing has extended the model across Ayrshire by through a consortium of four housing associations. The development and day to day management of the project is handled by the Ayr-based Aspire2gether. This independent social enterprise is also a leading provider of housing support and related services across Ayrshire.